Dust plays an extremely important role in the universe – both in the formation of planets and new stars. But dust was not there from the beginning and the earliest galaxies had no dust, only gas. Now an international team of astronomers, led by researchers from the Niels Bohr Institute, has discovered a dust-filled galaxy from the very early universe. The discovery demonstrates that galaxies were very quickly enriched with dust particles containing elements such as carbon and oxygen, which could form planets. The results are published in the scientific journal, Nature. Cosmic dust are smoke-like particles made up of either carbon (fine soot) or silicates (fine sand). The dust is comprised primarily of elements such as carbon, silicon, magnesium, iron and oxygen. The elements are synthesised by the nuclear combustion process in stars and driven out into space when the star dies and explodes. In space, they gather in clouds of dust and gas, which form new stars, and for each generation of new stars, more elements are formed. This is a slow process and in the very earliest galaxies in the history of the universe, dust had not yet formed. But now a team of researchers have discovered a very distant galaxy that contains a large amount of dust, changing astronomers’ previous calculations of how quickly the dust was formed. “It is the first time dust has been discovered in one of the most distant galaxies ever observed – only 700 million years after the Big Bang. It is a galaxy of modest size and yet it is already full of dust. This is very surprising and it tells us that ordinary galaxies were enriched with heavier elements far faster than expected,” explains Darach Watson, an astrophysicist with the Dark Cosmology Centre at the Niels Bohr Institute at the University of Copenhagen. Darach Watson led the project, with Lise Christensen from the Dark Cosmology Centre and researchers from Sweden, Scotland, France and Italy. Electron microscope image of dust particles from interstellar space. 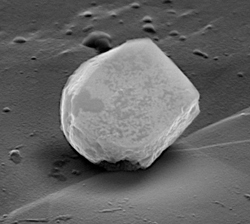 The dust particles are typically about 100 nanometers (one nanometer is one millionth of a millimeter) and are made up of either carbon (soot) or silicates (fine sand). Because the galaxy is very distant and therefore incredibly faint, it would not usually be detectable from Earth. But a fortunate circumstance means the light from it has been amplified. This is because a large cluster of galaxies called Abell 1689, lies between the galaxy and Earth. The light is refracted by the gravity of the galaxy cluster, thus amplifying the distant galaxy. The phenomenon is called gravitational lensing and it works like a magnifying glass. 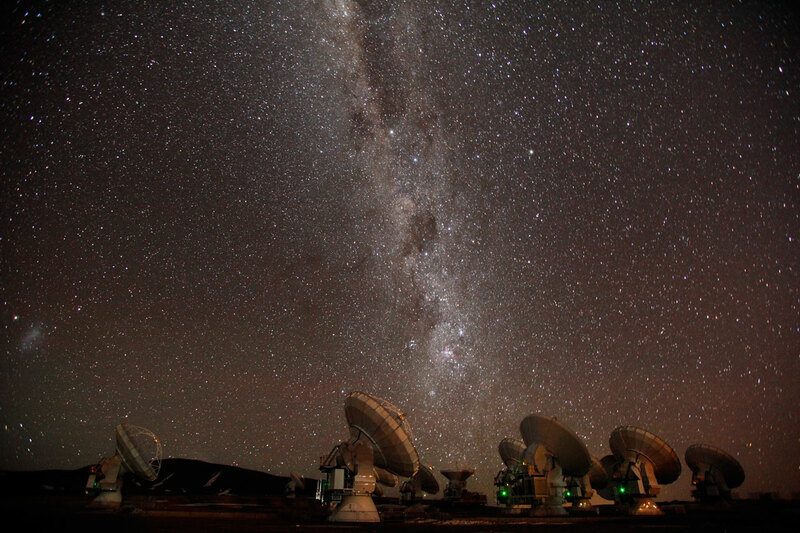 “We looked for the most distant galaxies in the universe. Based on the colours of the light observed with the Hubble Space Telescope we can see which galaxies could be very distant. 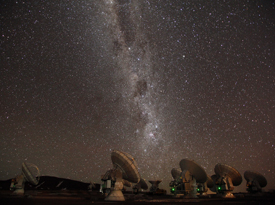 Using observations from the very sensitive instrument, the X-shooter spectrograph on the Large Telescope, VLT in Chile, we measured the galaxy’s spectrum and from that calculated its redshift, i.e. the change in the light’s wavelength as the object recedes from us. From the redshift we can calculate the galaxy’s distance from us and it turned out to be, as we suspected, one of the most distant galaxies we know of to date,” explains Lise Christensen, an astrophysicist at the Dark Cosmology Centre at the Niels Bohr Institute. Darach Watson explains that they then studied the galaxy with the ALMA telescopes, which can observe far-infrared wavelengths and then it became really interesting, because now they could see that the galaxy was full of dust. He explains that young stars in early galaxies emit hot ultraviolet light. The hot ultraviolet radiation heats the surrounding ice-cold dust, which then emits light in the far-infrared. “It is this far-infrared light, which tells us that there is dust in the galaxy. It is very surprising and it is the first time that dust has been found in such an early galaxy. The process of star formation must therefore have started very early in the history of the universe and be associated with the formation of dust. 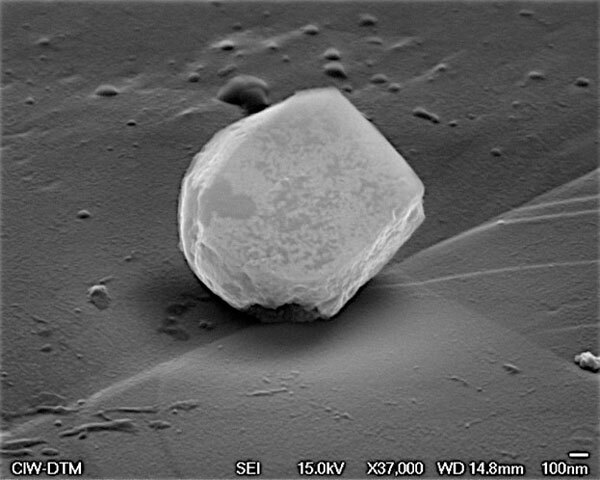 The detection of large amounts of solid material shows that the galaxy was enriched very early with solids which are a prerequisite for the formation of complex molecules and planets,” explains Darach Watson. 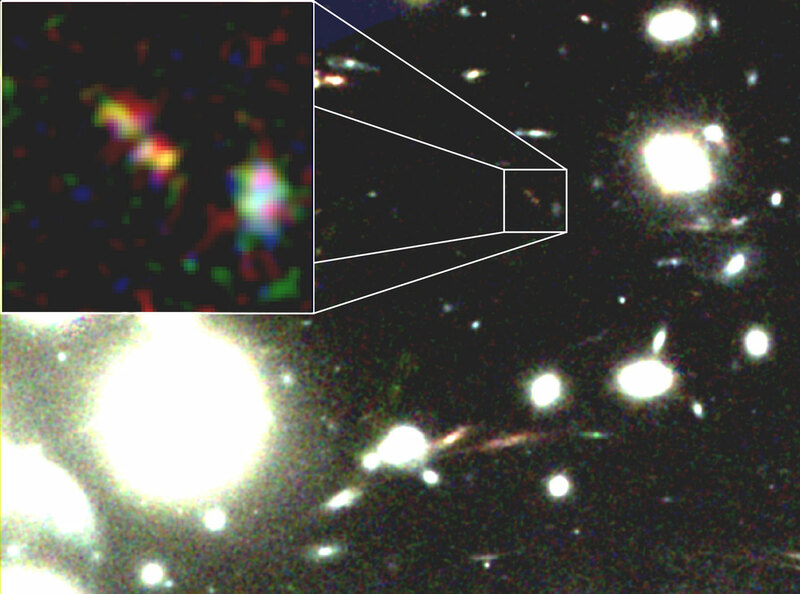 Now the researchers hope that future observations of a large number of distant galaxies using the ALMA telescopes could help unravel how frequently such evolved galaxies occur in this very early epoch of the history of the universe.